Beans, pasta, nuts, and dried corn, 21" x 25"
Into the twentieth century, art and food took on a different relation as food became not just a subject, but an artistic medium. From fruits and vegetables, to gum and candy, to butter and eggshells, artists are using atypical mediums to grab viewers attentions and sparking colorful reactions. “Playing with their food,” these artists create sculptures, paintings, and “foodscapes”, sometimes filling entire rooms with edible art. 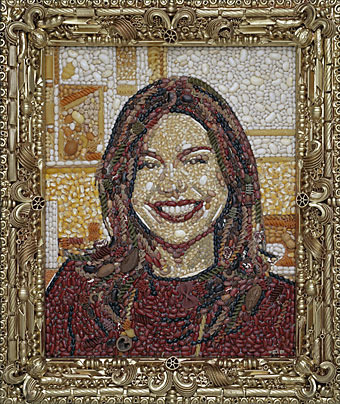 Using a variety of foods like potato chips, beans, hamburger buns, candy, cookies, noodles, and pretzels (just to name a few), artist Jason Mecier creates mosaic portraits of cultural icons such as Rosie O’Donnell, Jerry Seinfeld, Boy George, and Rachel Ray. Both humorous and imaginative, these painstakingly detailed portraits push the boundaries of what we call “art”. [fig. 1.5] Sculpture Jim Victor uses mounds and mounds of butter to create over life-size figures of horses, children, and cows. [fig. 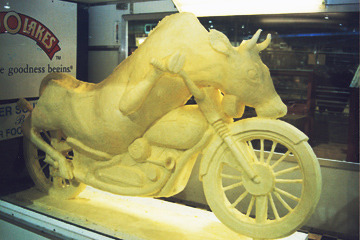 1.6]Although butter sculpting is not new, sculpted butter can be historically found on banquet tables, the practice has become increasing popular in the mid-west and is a popular attraction at agricultural fairs. Recently, the phenomenon has been documented in the 2012 film, Butter, staring Jennifer Garner. For more unique and fascinating examples of edible art, click here.